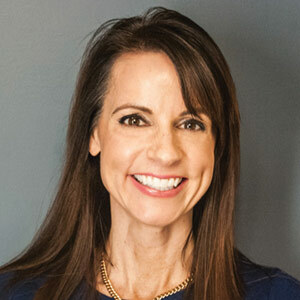 Have you ever had someone that you thought was your friend, but who through time, disagreements or rough waters turned out to be someone completely different? That’s what the sun and the environment is to our skin. We think it is a friend, but it is capable of hurting us just like a frenemy. There’s no question, we need the sun and its many benefits. It is essential to our mental health and provides us with vitamin D for strong bones. Environmentally, there are countless benefits such as producing oxygen for plants. Let’s face it, we cannot survive without the sun. What we don’t need are the negative effects that come with it. Early in life, our skin is firm and radiant. Exposure to the environment and sun cause free radicals to form in the skin. These two frenemies are everywhere, even on cold cloudy days, wreaking havoc on our skin and bringing out a whole slew of issues along with internal inflammation in the body. These free radicals attack the skin causing major changes including collagen break down, loss of elasticity, uneven pigmentation, wrinkles, hyperpigmentation and even skin cancer. 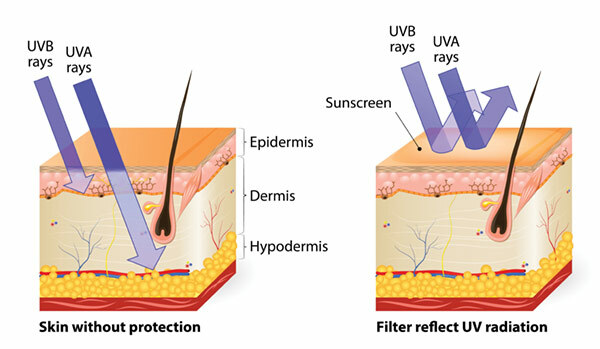 Ultraviolet (UV) radiation is the primary cause of free radicals in the skin. There are two types of UV rays—UVA and UVB. UVA rays cause aging, specifically decreased skin elasticity, hyperpigmentation and wrinkles, as mentioned previously. UVA rays are present year-round and can penetrate through clouds and glass. What makes them even more “mean” is their ability to penetrate 30-40 times deeper into the skin than UVB rays. And like a true frenemy, we will not see the effects of these rays for years down the road. UVB rays burn skin. This is what we see right after sun exposure. These rays are less sneaky, and skin can be protected from UVB rays with sunscreen. In other words, pollution is anything added to the air, land, water, etc. that wasn’t meant to be there. Although there are many types of pollution such as land, water, air, thermal, light and noise, the type that most aggressively affects the skin is air pollution. Pollutants are tiny particles in the air. UV rays from our frenemy, the sun, capture these particles and push them into the skin. One-third of the polluted air in San Francisco comes from China. Breathing the air of Beijing has the same health risk of smoking 21 cigarettes a day. Breathing the air of Mumbai, India is equivalent to smoking 100 cigarettes. Forty percent of Americans are breathing unhealthy air. The Great Wall of China is not visible from space, but China’s air pollution is visible. Two of the best ways to combat air pollution are walking and riding a bicycle. Short term effects of air pollution can be irritation of the eyes, ears and nose, which can lead to upper respiratory infections such as bronchitis, pneumonia and asthma. Long term effects are chronic respiratory infections, lung cancer and even heart disease. 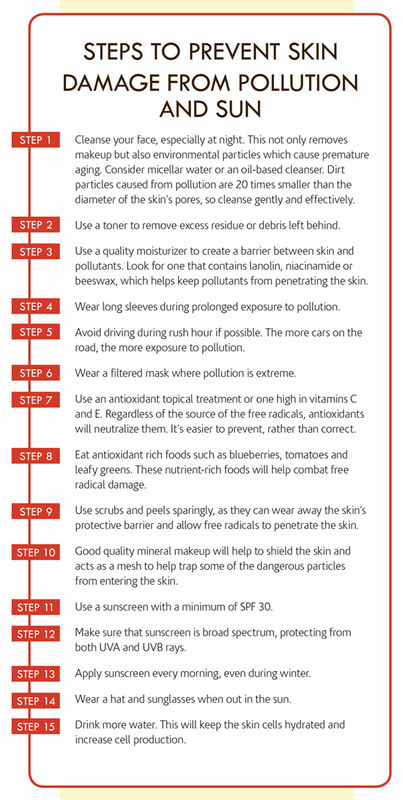 Once pollution penetrates the skin, it causes inflammation. Some inflammation leads to increased melanin production and hyperpigmentation. Urban areas have higher levels of pollution known as particulate matter (PM), tiny particles of nitrogen dioxide (NO2) and chemicals such as polycyclic aromatic hydrocarbons (PAHs). PMs are the biggest problem for the skin. They increase hyperpigmentation and wrinkles. As the blood vessels grow, increased redness and rosacea can result. When damage like this occurs, the skin goes into repair mode. Enzymes become excited and reabsorbed, and this causes more inflammation. Chronic inflammation will lead to skin laxity, which will bring on fine lines and wrinkles. Other symptoms of air pollution exposure are eczema, hives, acne-like eruptions and darkening of the skin. Although much is being done to control and maintain pollution, education is truly the key to the preservation of our environment and the goal to leave it in better condition for future generations. To check pollution levels in your area, go to www.airnow.gov. Pollution is global, and it is not going away, so we need to find out the best way to manage it. Similarly, the sun will be in the sky as long as we live, and depletion of the ozone is increasing penetration of UV rays. It is vital to maintain the health of skin, since it is a barrier. The healthier skin is, the better it will fight pollution and sun damage. People forget that the main goal of the skin is to provide a barrier of protection for the body. Although it’s impossible to avoid pollution and the sun, protect skin from these frenemies and reduce the damage they can cause.